Steven (Chicagoland, United States) on 10 April 2013 in Cityscape & Urban and Portfolio. Warped reflections of people and Chicago's skyline are reflected on the surface of Cloud Gate, also known as "The Bean", spotted in Millennium Park in Chicago, Illinois. 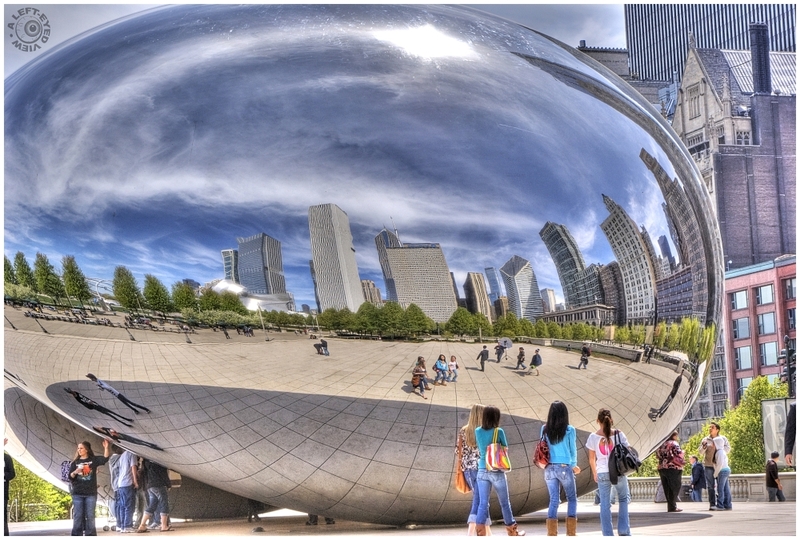 Chicago's most famous reflective sculpture. Nicely captured and processed. Second time around and I think I've found you at last in the reflections. Is that you with the tripod? @Curly: Not me with the tripod. Since this was taken back in 2010, I can't really remember where I was standing, but this was a single-shot HDR. I believe I was standing near the trees in front of the BP Amoco Building (tall square white shape). The four girls in front are relatively close to The Bean, but their reflection makes them seem much further away. Wonderful creative shot! Fantastic place and beautiful reflective sculpture. Amazing shot and very surreal reflections. Interesting self-portrait as well! This is superb :), tripod with an umbrella? fascinating and unique way of looking at the famous skyline! your expert processing gives this image a strong painterly touch! So sci fi ! I love it ! The camera never tires of the Bean ! An excellent capture of this famous reflector ! The HDR looks wonderful. Details of the clouds, framing, reflection, distortion...Excellent ! Wonderful combination of the HDR effect and the reflection. The color and light are sensational! Cool shot and beautiful reflection of the city! Oh this is my favorite of yours that you have posted of this Cloud Gate - I Would LOVE to see this in person :-) Wonderful composition and processing as always, Steven! A beautiful shot! I would like to see this bean. Looks like a giant bubble! Fabulous image! Gorgeous image! I have always wanted to see this! @Elaine Hancock: More to see on Friday! I would love to see this myself. What a fun place to shoot.